Let’s boat to New Orleans! For the last 300 years, New Orleans has been one of the great cultural gems of the world. It’s a place where the locals’ laissez-faire hospitality and friendliness attract visitors from all over the world. With its classic architecture draped in Spanish moss, there are few other places so enchanting. 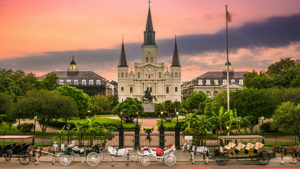 Spend the day wandering the streets of the iconic French Quarter and catch a brass band playing in Jackson Square. Stroll down gallery-lined Royal Street and take in the beautiful work of New Orleans’ many artists. 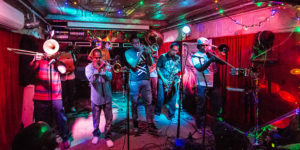 Then dance the night away at nearby Preservation Hall, one of the city’s most iconic jazz clubs, owned and operated by the same family since the 1960s. The next morning, take the lovely street car ride Uptown along oak-lined St. Charles Avenue and marvel at the stunning architecture, then stop by Camellia Grill for breakfast. Afterward, visit picturesque Audubon Park, just a few streetcar stops down. Audubon Park hosts the New Orleans Zoo and the Tree of Life, the oldest live oak in town. Follow the pathway to take in the grandeur of the mighty Mississippi River at Audubon’s upper park. Don’t miss a trip to Domilise’s for the best fried shrimp po-boy imaginable. Just a mile farther down the road is the legendary nightclub Tipitina’s, where you can dance the night away to some of the best musicians anywhere. But the most important thing to do in New Orleans is to go wherever it takes you. Let the spirits that dwell here guide you. Don’t be afraid to take your cocktail with you out onto the street or to greet strangers passing by. Become a New Orleanian, even if just for a day or so, because you haven’t truly lived until you’ve been down to the Big Easy! 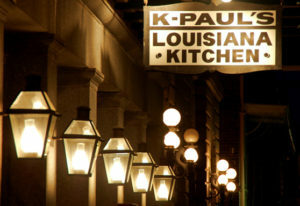 K-Paul’s Louisiana Kitchen (416 Chartres St.) Grab some blackened red fish and a cup of gumbo at K-Paul’s Kitchen, the French Quarter’s quintessential Cajun-Creole establishment. Clancy’s Restaurant (6100 Annunciation St.) Elegant Creole classics and spirits can be found at this Audubon neighborhood spot. 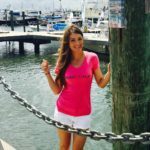 Pêche Seafood Grill (800 Magazine St.) The popular eatery serves simply prepared contemporary dishes plus fresh oysters and Gulf fish. group of young music fans. Maple Leaf Bar (8316 Oak St.) Opened in 1974 and one of the longest continuing operations of New Orleans’ music clubs. Rock n’ Bowl (3000 S. Carrollton Ave.) Catch Thursday Night Zydeco here — a genre of music indigenous to Louisiana Creoles.